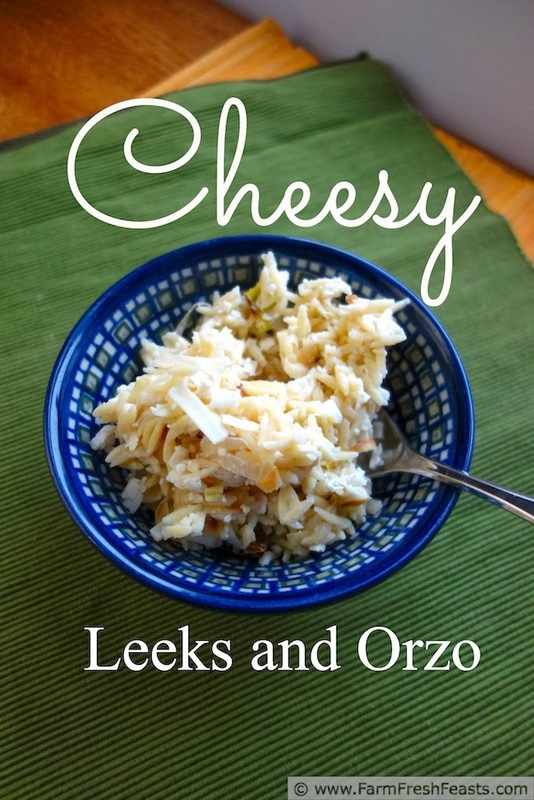 Let your leeks shine in this simple and quick side dish of orzo pasta, leeks, and cottage cheese. After a busy AppetizerWeek last month where I really buffed up my appetizer section, I poked around on my recipe index by category (on the right side bar, not to be confused with the recipe index by ingredient up along the top) and thought that I ought to be sharing some more simple side dishes that I feed to my family, using the vegetables from our Community Supported Agriculture (CSA) farm share. Wow--that was a run on sentence. My apologies. The unrelenting cold numbs my fingers and brain. Perhaps after a week in Florida I'll be coherent? Gotta get through this week first. Today's recipe came about because I wanted a side dish that would appeal to the whole family and my CSA farmers had grown a stupendous crop of fat and sassy leeks. I generally wash, slice, spin dry, and freeze my leeks for use over the winter (in soups, stews, etc) but I like to use some fresh, too. While leeks are usually supporting players in my dishes, I've seen gorgeous ways to showcase them like Kristy's Crispy Leeks. I wanted a softer leek (my son had recently had his wisdom teeth out) and to let that nice mild flavor shine through. We had this side with spicy salmon, but it would go equally well with chicken or pork. Leftovers reheated well the next day. For more recipes using leeks, please see my Leek Recipes Collection. It's part of the Visual Recipe Index by Ingredient, a resource for local seasonal eaters like myself who want to make the most of their farmer's efforts. I'm pinning all sorts of recipes to my Pinterest boards, follow me there. I'm sharing recipes and articles that catch my eye on my Facebook page, follow me there. For a carefully curated behind the scenes (complete with howling Basset hound) please follow my Instagram feed. Want to know How To Use This Blog? 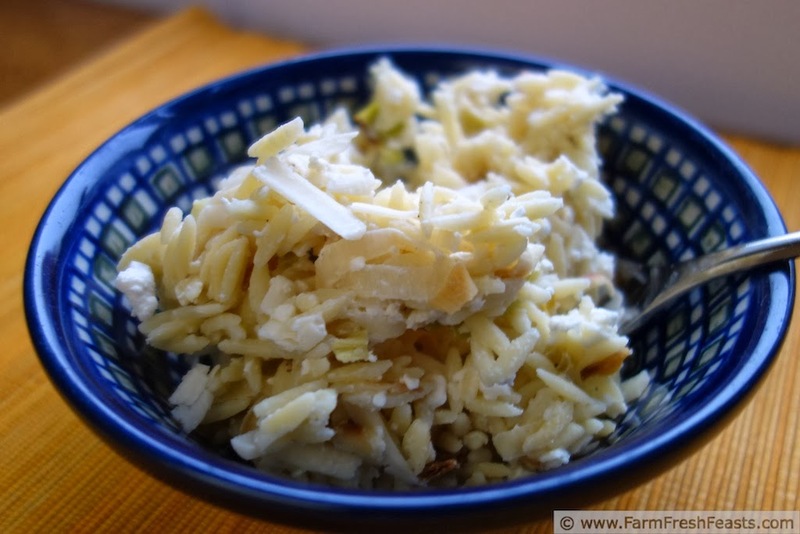 NOTE: This recipe is not gluten free as written, because I used orzo that contained gluten. To adapt this recipe for a gluten free diet please substitute the gluten free orzo of your choice. 1 cup leeks, sliced into thin rounds, rinsed several times, and spun dry. Sauté leeks in butter with a pinch of salt until softened. 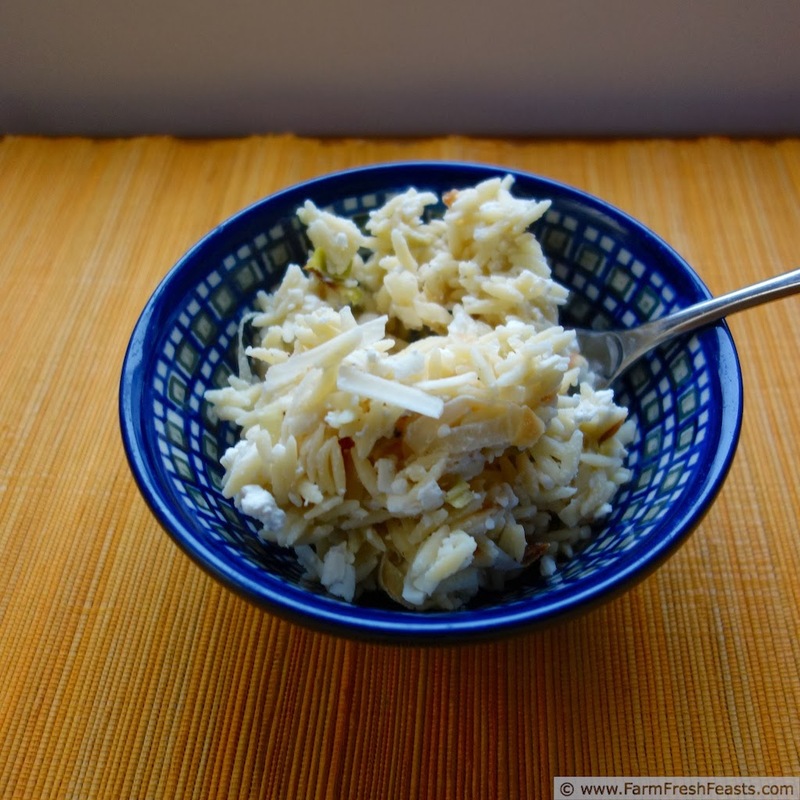 Toss leeks with cottage cheese and cooked orzo in a large bowl. Stir in shredded cheese until just blended. Taste and add freshly ground pepper or additional salt as you like (I add a good 10 grinds of pepper, plus more at the table). Leeks always make me think of spring! I'm hopeful it's just around the corner... :) This sounds like a really great side! I don't think Spring is right around the corner . . . not with the snow we've been having. However I'm hopeful for a lush Spring with all this water. Thanks! I just made orzo for the first time in a long time, and the kids just thought it was the best pasta ever. How the shape changes the taste...I'm not sure. The cottage cheese is a very interesting addition, I've never used it in a pasta dish. Sounds yummy! I think it's pretty neat how kids will like one type of pasta but not another. Then again, I very much prefer angel hair or thin spaghetti to those fat spaghetti noodles . . . so I can see the point. And now I need to pick up orzo and I just went to the grocery store yesterday. Dammit. You are making recipes quicker than I can recreate them. Of course you had me at cheese in this one. I'm a little skeptical of cottage cheese because it always seems so diety to me (like rice cakes), but since you're pairing it with some of my favorite and satisfying things (butter and cheese), that is obviously not the case. You've also never steered me wrong before so this is going on the list. Can't wait. HA! If you knew how my brother and I eat cottage cheese--sprinkled with seasoned salt and scooped up with ruffled potato chips--you'd never see it as a diet food. It's comfort food to me (and so so so good with chips!). This looks so good! And now I need to buy leeks. My CSA farmers were so productive last year that I've still (STILL!) got sliced leeks in the freezer. I'm going to try them in a Beef Hushwee from Liz's Lemon Bowl, in place of frozen onions.